Each year, HOPE celebrates clients who demonstrate our values of perseverance, compassion, character, and creativity by announcing the Thurman Award winner. Established in honor of HOPE’s first CEO, the Thurman Award celebrates clients who have not only experienced change in their own lives but have also extended that transformation to others in their community. We’re excited to share the story of Eckness, this year’s winner of savings group programs! When Eckness was a teenager, her family could no longer afford to send her to school—a problem many Malawian families face. And like many Malawian youth in her situation, Eckness dropped out of school and got married. 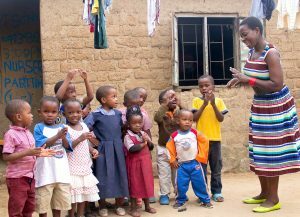 Using loans from her savings group, Eckness obtained her high school degree, a college degree in early childhood development, and a certificate in business management. After finishing her own education, Eckness was able to turn her attention to a need that had always disturbed her: the lack of affordable daycare options in her community. With deep compassion for her students, Eckness gives grace for those who struggle to pay their school fees. Many of her students come from Muslim families, and Eckness is eager to share her faith with them. Around the HOPE network, clients are growing closer to Christ, saving their own money, and employing their God-given skills to care for their family. Learn more about how HOPE equips families to flourish. As Christ’s followers responding to His great love, HOPE International seeks physical, social, spiritual, and personal restoration in places of brokenness. Through Christ-centered microenterprise development, we empower men and women to strengthen their families, build their businesses, and unleash their dreams. Christ calls us to care for those living in poverty.